NEW! 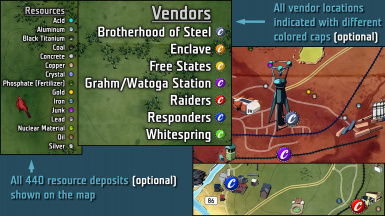 Now includes vendors and all 440 resource deposits! (Both are optional.) 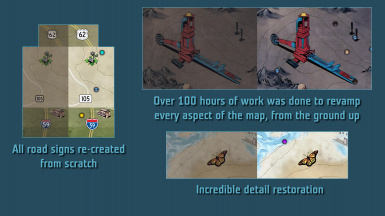 A crisp and highly detailed map replacer. Tired of the faded, blurry, and pixelated in-game map? Ultimist's High Detailed Map is for you! Ultimist (a NexusMods user) is the sole author of all modifications and improvements in this mod. Resource and vendor marks are now optional. 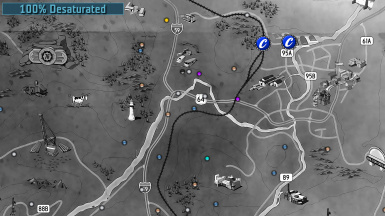 Made the resource marks a bit smaller to avoid them being confused for fast travel map markers. Too many changes and improvements to list here. See the mod description page! Ultimist's High Detailed Map PLUS uses a new 8k map texture (8192 x 8192 pixels). The vanilla map is 4k (4096 x 4096), and yet lacks sharpness and detail. When you zoom in to a location on the vanilla map, it starts to pixelate due to the game's basic scaling algorithm. 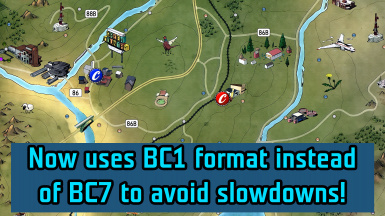 With this mod, your map won't look pixelated when fully zoomed in. It should also look great on 4k displays! The screenshots speak for themselves. There's a new method to make my mod work, and it works with Patch 8. Be sure and keep references here for any other mods you might be using. NEW! Version 2.5 of the map has been created by starting over with the base map from the game. A new door for Vault 76. 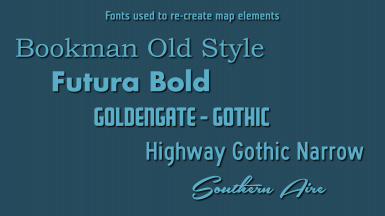 All map text painstakingly re-created for better clarity. 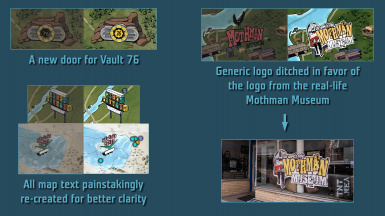 Mothman Museum logo ditched in favor of the logo from the real-life Mothman Museum. 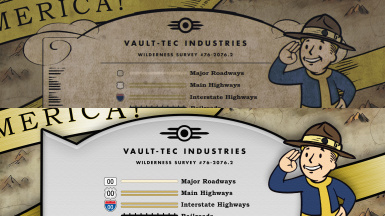 All road signs on the map have been re-created from scratch. 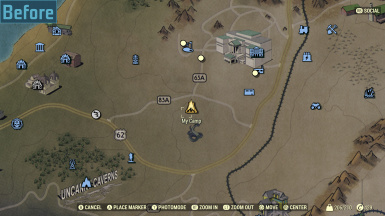 All map overlay elements have been re-reated from scratch. Careful denoising has been used to remove the strange crosshatch noise pattern. 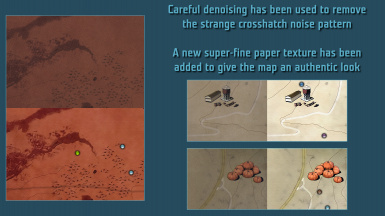 A new super-fine paper texture has been added to give the map an authentic look. A brand new frame to replace the ugly, uninteresting frame in the vanilla map. 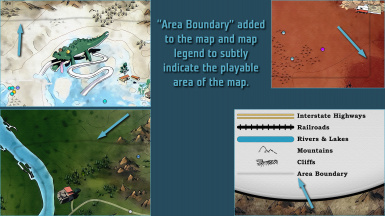 "Area Boundary" added to the map and map legend to subtly indicate the playable area of the map. Many more subtle (and not-so-subtle) changes. Several versions of this mod are available: Versions for use with the Baka File tool (standard and saturation options), and a .ba2 archive version that requires a customized Fallout76Custom.ini file. 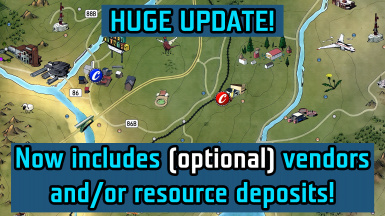 Download your choice of mod, whether it be the default map that does NOT include vendor or resource marks, the version that shows BOTH, the one that shows vendors only, or the one that shows resources only. Open the downloaded archive. Choose a folder, either the ba2 version or the loose files version. Go into the folder for the saturation option you want. Follow the instructions in the text file located in that folder. 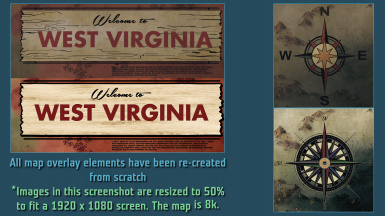 Copy the textures folder to your Fallout 76 Data folder, overwriting files if necessary. Use Baka File Tool to create the proper files to enable the mod in your game. Consult the Baka File Tool mod page for instructions on how to use it. Discard other versions you don't need. Enjoy your awesome new map! IMPORTANT! 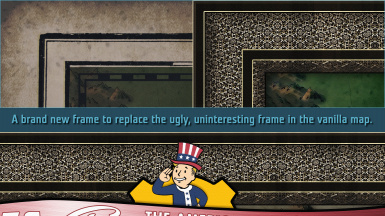 The entries for Fallout76Custom.ini are different for this mod than they may be for others. Take note! 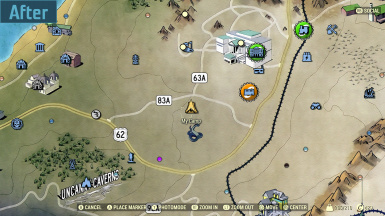 Copy UHDmap.ba2 to your Fallout76\Data folder. Please consider donating if you enjoy my work!